Ten days after the federal holiday honoring Martin Luther King Jr., William & Mary students, faculty and staff joined with the greater Williamsburg community to commemorate his life and legacy. 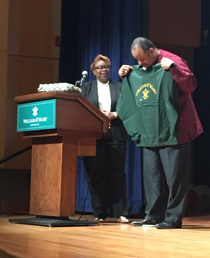 Renowned journalist Roland S. Martin served as the keynote speaker for the annual commemoration event, which took place in the Sadler Center’s Commonwealth Auditorium Jan. 31. Bobak Kasari, assistant to the dean of students, moderated the conversation. The event was preceded by a candlelight march from the Wren Building to the Sadler Center. A welcome by Shené Owens, assistant director for the Center of Student Diversity, started the evening off on a joyful beat. 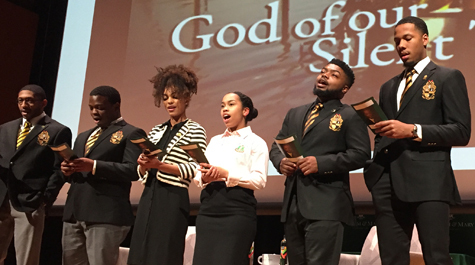 With an opening sing-along to “Lift Every Voice and Sing” by the leaders of the Kappa Pi chapter of Alpha Phi Alpha Fraternity, William & Mary NAACP and Black Student Organization, the evening was filled with vigor and celebration. Although lyrics were provided for the song, many in the crowd knew the words by heart. Owens finished her welcome with a short YouTube video from Kid President about King, detailing a kid’s perspective on his life and mission. The youthful message was cute and clear: King’s thoughts about love and unity should continue to be spread, even beyond his death. Following Owens, local high school student Betina Ross delivered an original spoken word poem, “What Would Martin Luther King Jr. Say about Black Lives Matter?” Her poem also asked the question of whether Christians should participate in civil disobedience. Quoting multiple passages in the Bible, her firm answer clearly stated that King would be supportive of Christians acting in civil disobedience, adding three distinct tips to keep in mind when fighting for social justice: be prepared, bad things might happen, and don’t grow weary doing good. Martin, host of an online news show, author and former CNN correspondent, is a well-read expert on and enthusiast of King. In front of the crowd of students, faculty, staff and community members, Martin spoke about the legacy and truth of King. “Do we want to be honest with ourselves as to who we’re celebrating tonight?” he asked the crowd. Noises of agreements and boisterous words of approval were heard from the audience. Martin spoke candidly about the civil rights leader. In fact, Martin said King would probably find it problematic that the day was about him and not the movement. Martin spoke about the other often-forgotten activists, writers, musicians and artists that fueled the movement for African-American rights within the United States. To top it all off, Martin connected his thoughts on King with today’s social movements, specifically Black Lives Matter. According to Martin, King laid out the framework for social movements today by learning from history, listening to both young and older people, and continuing to fight for what is right even when faced with violence, hatred and bigotry. Martin also spoke frankly about America’s treatment of King, both during his lifetime and postmortem. He informed the crowd that, even when King was alive, both black and white people did not approve fully of his social and political ideologies. But nonetheless, Martin explained, he is celebrated to this very day. Martin’s central message was clear: Learning from history is not simply enough to combat hatred in our world. Resilience is not strictly a youthful attribute, nor is it something gained from decades of life. And finally, living in an age of fear does not call for divisiveness, but rather unity. Another face: Lynn Briley's book.